At Mizzou we saw people of all colors and ethnicity stand together in solidarity against the inequality of African Americans on campus. This sparked a flame on college campuses everywhere, students began to peacefully protest in support of the students on Mizzou’s campus. As we took two steps forward, we must now take three steps back. Chaos ensued on Mizzou’s campus and has now trickled over to Harvard Law School, an Ivy League institution. 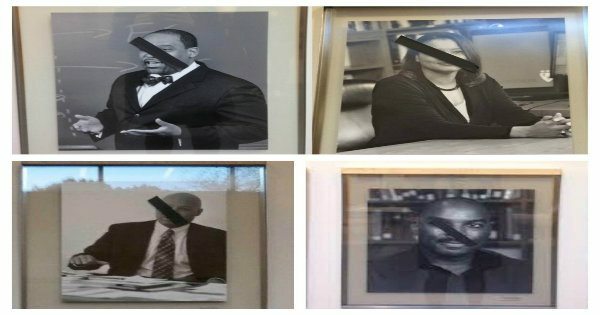 Thursday, November 19th, in Wasserstein Hall on Harvard’s campus, someone put black tape over the faces of the African-American faculty. Although there are pictures of other faculty members of color on the wall only the African America faculty’s photos were defaced. This is not a coincidence. Harvard Police are investigating the incident. While some students are shocked by what has happened, I’m sure most black student are not. We are constantly being accused of playing the race card but when a clear and blatant hate crime is committed against an African American, silence comes over the crowd. I guess those black faculty members did something to deserve being targeted. Until this country admits that we have some major issues to take care of involving racism people will become more and more comfortable with attacking African Americans. They will become more and more comfortable with giving us harsher sentencing on crimes that probably should have never made to court. More and more comfortable with putting the life of an animal on a higher pedestal than the life of a black person. Let’s pray that no harm comes to these faculty members. Let’s force America to see that we are not problem. Previous articleThe Original Statue Of Liberty Was An…. African Muslim!!! Next articleSchool Resource Officers Tasing Students, Have They Taken It Too Far or Is This Necessary? If you do the HISTORY of Harvard Law School and Slavery owner donated the land for the school. White Cop With African Ancestry Sues City And Chief Over Racism!